Only clocks manufactured by Smiths or Jaeger are repairable with the Clocks 4 Classics Kit. If the clock has a part number and it starts with “CET” or “CTE” then the clock uses a transistorised movement and is NOT suitable for repair with the Clocks4Classics Repair Kit. Look at the rear of the clock. If you see a pattern of four screws as shown below then it will almost certainly be repairable using the Clocks4Classics kit. 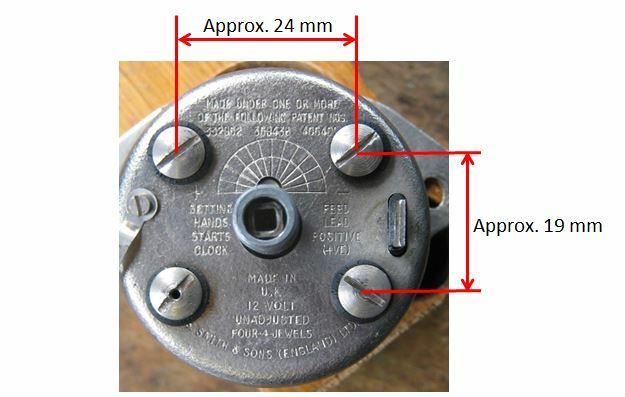 Please note that the type of screws will vary from clock to clock; it is the pattern and dimensions shown that are important. The photos below show the rear of several of different clocks all of which are repairable. In a few cases only three of the four screws may be present but the dimensions will be the same. Contact us and we will be happy to help. If you can send photos of the front and rear of the clock that will help us identify it.